The resort offers you sweeping views of the south side of the island. Peak after peak is on show, filling you with the wonder of what you can discover when you venture out the next day. The resort is just a 15-minute stroll to Porto Novo, where you can enjoy drinks and lunch at wonderful, simple Cape Verdean restaurants. Excursions for full day or half day tours can be booked locally, as well as walking tours. Don’t miss out on what this stunning island has to offer. Santantao Art Resort offers the perfect base for holidaymakers hoping to discover the must-see scenery of the breathtaking island of Santo Antão, set at the foot of its stunning mountainous landscapes. The spacious and well-kept grounds of the resort are an attractive place to unwind, decorated with pretty flowers and swaying palms, and also boasting an inviting swimming pool to soak in after a day’s hiking in the surrounding mountains. Your room will be both simply furnished and equipped with good facilities, while the hotel’s restaurant and bar serve up delicious regional cuisine and refreshing drinks to ensure even more comfort throughout your stay. Guests can also make the most of various room upgrade options, including upgrades to Superior rooms and Suites. If it’s relaxation you’re after, you’ll need little effort to achieve it. Simply through admiring the wonderful sea views and the distant mountainous vista of São Vicente, you will find yourself feeling a sense of serenity, especially from the terrace – the perfect place to relax and unwind with a cool drink. Your international flights are direct to Sal, then internal flights to/from Santo Antão. Santo Antão is best experienced as part of a multi-centre island hopping holiday around the archipelago. We offer a number of itineraries that include a stay on Santo Antão. Visit our Island Hopping Holiday Ideas, or call one of our experts about a tailormade itinerary. 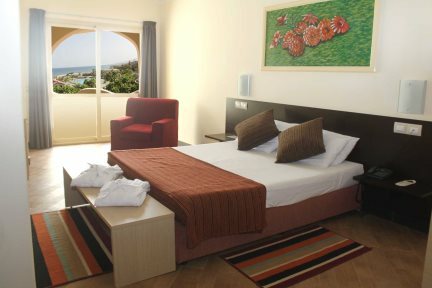 Double rooms with en-suite shower room, a balcony or terrace and most of these rooms have a side sea view. Twin bedded rooms are on request. Superior double rooms have a little more space, en-suite shower over bath, a balcony or terrace and have a sea view. Suites have a little more space, lounge area, en-suite with shower over bath, a balcony or terrace and have a sea view.